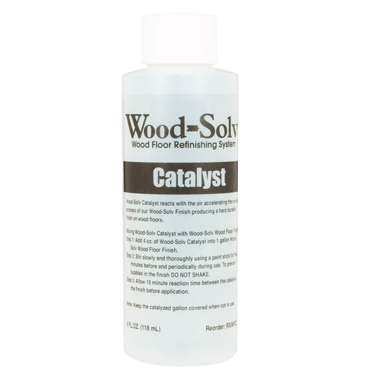 Wood-Solv™ Finish - Catalyst, 4 oz. Unique water-borne catalyzed urethane coating, superior to conventional clear finishes, that locks down final transparent top coat. Wood-Solv Finish is available in Gloss, Semi-Gloss and Satin Finishes. Semi-Gloss and Satin minimize flooring imperfections. Wood-Solv Water-Based Catalyzed Polyurethane Floor Finish provides a hard, durable finish that is beautiful and twice as durable as traditional urethane finishes. Wood-Solv Wood Floor Finish provides the ultimate protection for hardwood floors that is hard, clear and beautiful. Wood-Solv Wood Floor Finish is a catalyzed urethane finish that has been specifically formulated to provide the best scuff and scratch protection available. Nothing gives you better protection for wood and laminate floors. Over twice as durable as traditional wood finishes and extremely fast-drying, Wood-Solv Wood Floor Finish is crystal clear,virtually odorless and provides for easy water clean up. Wood-Solv Wood Floor Finish provides a crystal clear, diamond hard, fast drying finish to the floor. Wood-Solv Wood Floor Finish is available in 3 sheens: satin, semi-gloss and gloss. 1 gallon provides 2 coats of coverage for about 500 sq. ft. of floor. Wood-Solv Wood Floor Finish System is designed to be used on wood floors that have a urethane protective finish already applied to them. May be used on hardwood floors, engineered wood floors, laminate floors such as Pergo®, cork floors and bamboo flooring. Note that the warranty on laminate floors made by some manufacturers is voided if a finish is applied. Check the floor for radiant heat using temperature sensitive tape.The floor should be between 60-85° for optimum rejuvenation. Catalyzed topcoat can be stored for up to 24 hours before use. Performance decreases dramatically at 48 hours - Never re-catalyze a catalyzed Wood-Solv Floor Finish. Has the best scuff and scratch protection available and a fast cure time too! 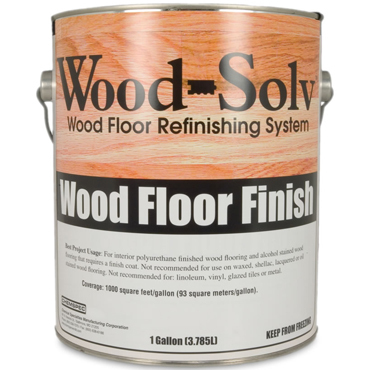 Wood-Solv finishes are virtually odorless and feature easy water cleanup. Use on interior polyurethane-finished wood flooring and on alcohol-stained wood that requires a finish coat. Not for gymnasium and sport type floors. Not for extremely heavy traffic floors as in some commercial applications. Not for use on waxed, shellac, lacquered or oil stained wood flooring. Not for use on linoleum, vinyl, glazed tile, or metal surfaces. Not for gym floors and other floors where heavy stop/start (friction and heat) activities occur. Not recommended where deep scratches are likely to occur such as from a clawed large pet. Not for use on linoleum, vinyl, glazed tiles or metal. Satin gloss finishes hide imperfections best and should be used on old or damaged wood floors. Semi-Gloss finishes will impart sheen to the floor without highlighting imperfections in the floor or minor repairs. Gloss finishes, while imparting a very high sheen, will highlight every imperfection and repair and are generally used on floors that have been sanded and stained. Use caution when recommending a gloss finish - imperfections are actually magnified! Protect Wood-Solv Wood Floor Finish from Freezing! Check label directions in case directions have changed since the printing of this web page. For best adhesion, surfaces must be clean, dry and free from wax, grease, oil, shellac, lacquer, mildew and polishes. Move all drapery up and out of the way. Sweep the floor first and then vacuum thoroughly. All dirt and grit must be removed so it does not get ground into the floor by the buffer. Dust mop all surfaces to be refinished. Use a quality micro fiber flat dust mop and slowly remove all dust and dry particulate. Care should be taken not to agitate the dust into the air as this will cause dust to settle on the finish as it dries. Mask off any flooring that is not going to be treated, and where appropriate, protect any wallpaper at or near the floor level to protect it from damage. Do not apply tape onto wallpaper. Waxes must be removed with Wood-Solv Step 1 Wood Prep; sanding does not remove wax. If staining is required, use water or alcohol-based wood stain before applying the finish. Stain must be thoroughly dry, preferably overnight. Use of oil-based stains will prevent proper adhesion. Clean the floor using Wood-Solv Wood Floor Cleaner to remove all spills and surface oils. Do not avoid this step; do not over wet. 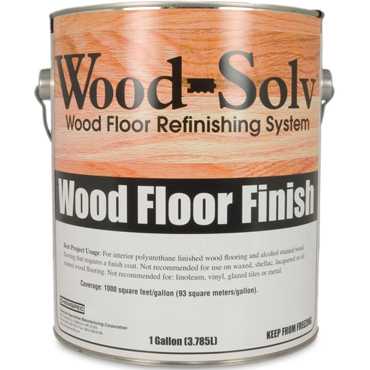 Repair the floor if necessary using Wood-Solv Floor Putty and Fill Sticks. Prepare the old polyurethane finish using Wood-Solv Step 1 Wood Prep. This process etches the old polyurethane finish providing tooth for the new finish. See Wood-Solv Step 1 Wood Prep label instructions for detailed application instructions. Begin by working around the edges, lightly pouring Step 1 directly onto the floor. of the room with the scrub block. A wet scrubbing must occur for Step 1 to be effective. Avoid all unnecessary contact with baseboards, appliances, cabinetry and other surfaces not meant to be coated. All areas requiring precision or areas that cannot be accessed with a low-speed scrubbing buffer should have Step 1 applied by hand to avoid mishaps. Allow the floor to completely dry before applying finish coats. For best adhesion, surfaces must be clean, dry and free from dust, wax, grease, oil,shellac, lacquer, mildew and polishes. Add 4 oz. of Wood-Solv Catalyst to 1 gallon Wood-Solv Wood Floor Finish. Add the catalyst and stir gently for 10 minutes. DO NOT shake! The catalyst is the “turbo charging” of the topcoat. It boosts the performance and protection of the finish. Add an equal amount of water and stir gently for another 5 minutes. 10 minutes before applying. Do not use on a later job! You can do your repairs while this is setting up. If using only part of semi-gloss or satin, stir well before pouring out! Pour a portion of the catalyzed Step 3 into a paint tray. Apply around the edges first with the Foam Block Edger. Pre-moisten applicator in water. Wrap masking tape around hand, sticky side out and pat applicator to remove loose fibers. Pour Step 3 Finish in an “S” pattern with the wood grain or use a paint tray. Dip the applicator into an applicator tray and apply coating to the floor in 4-foot sections. Pull in the direction of the grain. Be sure to “feather” at end of stroke. Apply in PAPER-THIN layers! Start with Microfiber Finish Applicator System. Allow to dry 75 minutes between coats. Allow each layer to dry completely before recoating. Draw the applicator toward you in smooth even THIN strokes with the wood grain. Apply some pressure while applying. Too little pressure will allow too much topcoat to “puddle” which will increase dry time. Topcoat will naturally level to some degree. Apply diagonally on Parquet wood floors. Allow finish to dry a minimum of 1 hour and then re-coat. Lower temperatures (below 55°F) and/or higher humidly (above 50% Relative Humidity) may cause slower dry times. Re-coat only when previous coat has dried clear and feels hard to the hand. If any coat has dried more then 24 hours, lightly Prep the coat before re-coating to avoid potential problems. A minimum of 2 coats is recommended. No more than three coats should be applied. Wear shoe booties to avoid contaminating the floor! Allow to dry about 8 hours before submitting to light use and 72 hours before returning to normal use. Wear stocking feet first 4 hours! If there is some contaminant in the topcoat, when you add the catalyst you will note some lumps in the mixture. Have a paint strainer with elastic (or cheesecloth) ready to strain out the contaminants before usage. Two people should complete the edging of a single room at one time, then work together to complete the room before moving on to the next. Immediately after application, wash applicator pad with warm, soapy water. Follow with a warm water rinse. Cover remaining Step 3 until ready for next coat, if needed. NOTE: Much more detailed information is available on the training video, in the training manual and in the training class. Unfinished Surface Preparation: Using a disk or screen sander, screen the new wood surface. Remove dust with a tack cloth or with a vacuum. Coverage: About 1,000 square feet / gallon / coat. Dry Time: About 75-120 minutes. Wood-Solv Finish is available in Gloss #63073, Semi-Gloss #63075 and Satin #63077 Finishes. Click the “Usage & Tips” tab above for an article titled “Hardwood Floors”. Learn how to refinish worn, damaged wood floors - and MAKE MORE MONEY! View the video on preparing wood floor for refinishing and the video on repairing wood floors before viewing this video.